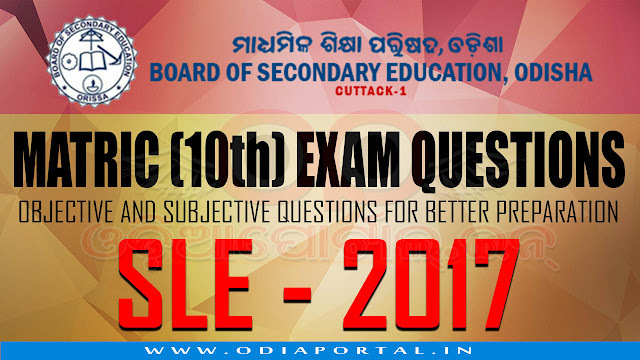 Subjective questions of HSC 10th Exam 2017 of SLE (Second Language English). A) "Odisha", My state : Location - the people living in it - their language and religion - their food and clothing festivals they observe how you would like to serve your state. B) Our Physical Education Teacher: Name, age, appearance and qualification - how he Conducts mass drill, sports and games - his dealings with students, staff and parents - his role in school functions- other activities in the school - why you love and respect him. C) The winter Season: its duration- Weather conditions - fruits and flowers available - festivals observed - how the people enjoy the season - Why you like / dislike it. Suppose you are Somya Rajan Jena, a student of class X at Salipur High School, Salipur in the district of Cuttack. You love nature and want to be an active member in the ECO Club of your school. Write an application, in about 100 words, to your Headmaster requesting him to allow you to join the Same. Mumbai, the first Cricket Club of India, was founded by Paris in 1848. India played its first Test match against England in the year 1932. C.K. Nayudu, an outstanding batsman of his time, was the country's first Test Captain. In modern cricket, Test Matches. One Day internationals and T-20 matches are played between national teams. In today's world, television coverage has made cricket very popular. Children in rural areas watch Cricket On television. Within a few years cricket has become most popular sport even in small towns and villages in India. Cricket has become popular all over the world. But our country has the largest number of viewers in the World. For Cricket, India has the largest market. Therefore south Asia has become the centre of Cricket-playing activities and the headquarters of ICC (International Cricket Committee) has shifted from London to Dubai. The famous historian Thomas Carlyle, after writing the manuscript of his book. "The French Revolution", gave it to one of his friends for reading. The friend's horse-keeper though it waste and threw it into the fire. When Carlyle's wife heard the news, she started crying. Carlyle's friend trembled and Carlyle himself could not utter a single Word. He could not sleep at night. The next day he got up with a resolution of start writing the book once again. It took him two years to complete the book. The French Revolution which is the symbol of his spirit and dedication. (i) Who was Thomas Carlyle? (ii) Why did he give the manuscript to his friend? (iii) Who burnt it by mistake and why? (iv) How long did Carlyle take to complete the book for the Second time? (v) What does the book "The French Revolution" Symbolize? (i) What happened to Lencho's Cornfield after the hailstorm? How did he react to it ? How according to Nehru, can we redeem Our pledge in full? (ii) What is the composition of air? When is air said to be polluted? How, according to Lord Eustace Percy, should students spend their leisure hours.